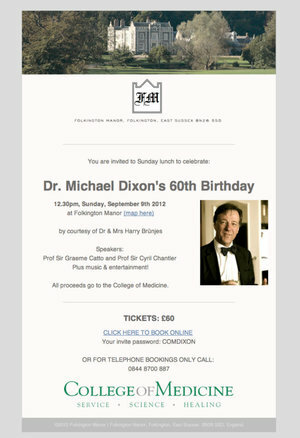 A fundraising dinner for The College of Medicine was held at Folkington Manor to celebrate Dr. Michael Dixon's 60th birthday. Michael Dixon is Chair of The College of Medicine, Chair of The NHS Alliance and President of NHS Clinical Commissioners. The event was hosted by Dr. Harry and Jacquie Brunjes. Michael Dixon and Harry Brunjes have been friends and colleagues since medical student days at Guys Hospital.